Meeting the challenge of providing medications to patients in bar coded unit of use typically requires multiple strategies. Organizations may choose to purchase medications in a bar coded unit of use form, purchase bulk medications and send them to an outsourced repackager, establish a repackaging operation in-house utilizing a high-volume unit dose packaging machine, or implement a combination of these approaches. Regardless of the strategy selected, certain medications will still require manual repackaging. The proper tools to safely and efficiently repackage these items, as well as standardize the repackaging process, are critical to ensuring the safety of manually repackaged medications. The University of South Alabama Children’s and Women’s Hospital (USACWH) is one of fewer than 10 freestanding hospitals nationwide providing care specifically to women and children. Offering in-hospital services for children and teens, maternity/newborn services, women’s services, and pediatrics clinics and hospitalists, USACWH delivers 3000 babies each year—more than any other hospital in Mobile—and operates the area’s only pediatric intensive care unit for critically ill and injured children. The Level 3 neonatal intensive care unit is the largest in the region. Ensuring that our manual unit dose packaging program is safe and efficient is critical to fulfilling the medication needs of our patients. Our first priority is to purchase medications in bar coded unit of use, a simple solution, as these medications arrive ready to administer without requiring additional repackaging or bar coding. However, as a 340B facility, we can often access bulk medications at a significantly reduced rate. Therefore, each purchasing decision is based on several factors, including safety, availability, ease of use, and cost. All small volumes of bulk medication are manually repackaged in unit dose; larger volumes are sent to an outside vendor for repackaging. To prevent waste, most small batch medications are unit dosed on an as-needed basis. These items typically include slower-moving medications; drugs that are used more quickly are either purchased in bar coded unit of use or shipped to an outsourced repackaging vendor. On a usual day, pharmacy staff repackages approximately 10 to 20 different items in varying quantities; volume varies based on the current patient population. Prior to each weekend, we repackage additional medications so that the weekend shift can maintain sufficient par levels. Although the pharmacy is open 24/7, staffing on the weekends is not as robust as throughout the week, so our strategy includes repackaging a higher number of medications on Thursday and Friday. Of course, when required, medications may still be repackaged on weekends. A robust quality assurance program is key to a safe, efficient manual repackaging process. When a bulk medication enters the facility, a standard repackaging and bar coding process must be in place to prevent errors. Identifying the appropriate tools to manage the repackaging process is central to this pursuit. Determine the organization’s needs and then conduct a comprehensive evaluation of the products currently available in the marketplace. USACWH chose a manual press-and-seal (blister pack) system for repackaging, a simple solution that required little training to master. Trays of cups are set up on a board for a technician to fill; after a tablet is placed in each cup, an adhesive sheet is rolled over the top to seal each dose securely in place. A bar code label is applied to each dose. This approach facilitates a safe, timely repackaging process that requires minimal cleanup. When choosing repackaging products, consider the vendor’s reputation, number of years in business, and products offered. Research the company’s history to identify any previous manufacturing challenges. A reputable company will have data on its products and be able to provide documentation supporting any classification claims. In addition, evaluate the product’s ease of use: Will the staff find the process straightforward? After a vendor is chosen, work closely with its representatives to build a strong relationship moving forward. Consistency is an integral element of a safe, compliant, unit dose packaging initiative. Ensure that repackaged products contain all the necessary information and that proper documentation is maintained. A standard template should be in use, as well as a standard repackaging procedure. When appropriate, light-sensitive and tamper-evident packaging may be used in the repackaging process. To prevent confusion over which products require special packaging, all of USACWH’s manually repackaged medications use light-sensitive, temper-evident packaging. We found that the slight cost increase for these features is offset by the peace of mind that comes from knowing all medications are packaged properly. For example, staff does not need to consider whether a medication stored under fluorescent lights is properly protected or if certain medications will be targeted for diversion; we know all manually repackaged products are safe and secure. 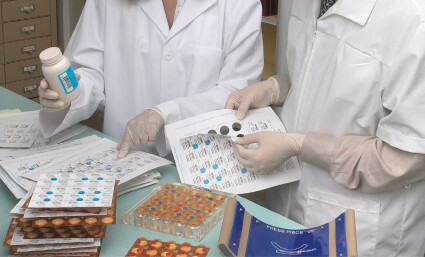 The pharmacist verifies the accuracy of every run of manually repackaged unit dose products by checking the medication against the original packaging, ensuring the physical packaging and bar coding is correct and scans properly, and verifying that the required documentation has been completed correctly. Striking an appropriate balance is necessary to supply sufficient par levels, control costs, and reduce waste. For example, we slightly increase par levels when a 3-day weekend is approaching. During downtime, walking the shelves is an important strategy used at USACWH to monitor par levels. This allows us to quickly identify items that are low and repackage small batches on a daily basis. We also maintain awareness of the possibility of recalls, because obtaining credit for medications that have been recalled is not possible. All newly hired full-time, part-time, and PRN pharmacists and technicians receive a training orientation, wherein the unit dose packaging components and process are explained. The repackaging process is performed in its entirety to allow staff members to witness the steps from start to finish and view the correctly repackaged final product. Training all staff members is critical to ensure repackaging can occur whenever it is required. For example, if a new product enters the facility at night or on the weekend, technicians must be competent to repackage these items. Prompt repackaging prevents a ripple effect of challenges downstream—for instance, bar code scanning delays due to invalid scans can correspond to missed charges. New technicians are mentored alongside an experienced technician until they demonstrate competency. After staff has received training, pharmacy leadership continues to observe their practice to ensure ongoing compliance with correct procedure. Any lapse in correct practice is addressed immediately. Newly hired pharmacists receive a full orientation, as well as training in documentation practices. The most significant challenge we have encountered when manually repackaging is accessing sufficient pharmacy space to perform repackaging duties. The repackaging process requires first laying out all of the required elements, which takes up substantial counter space. Repackaging medications in small batches allows us to work within the available counter space constraints and prevents confusion if a pharmacy technician is interrupted and called away from repackaging duties and then returns later to continue repackaging. Even in facilities with automated repackaging machines and outsourcing options, manual unit dose packaging is often required. Thus, developing a comprehensive, safe, and efficient strategy is not only prudent, but necessary. When manual repackaging is completed in line with standard procedures, pharmacy leadership can be confident that all items will be identical and will scan correctly. Furthermore, each label will contain all required information, including name, strength, and expiration date. If an error occurs, it is immediately apparent upon pharmacist verification. In addition, a tightly controlled manual repackaging process supports proper inventory management. Robert (Robby) C. Smith, RPh, MS, has been the director of pharmacy at the University of South Alabama Children’s and Women’s Hospital (USACWH) in Mobile, Alabama, since 2005 and a pharmacist in the University of South Alabama Health System since 1990. He graduated from the University of Mississippi School of Pharmacy in 1989 and received an MS in health care administration from Ole Miss in 1991. Robby’s professional interests include medication safety, pharmacy automation, and leadership development.